Use the power of the sun to give your home a nice decorative touch! The lights are available in a 50, 100 and the new 200 light strings! All Strings feature a 6 1/2′ lead line to place your solar panel. These lights only need one AA rechargeable battery which is included. 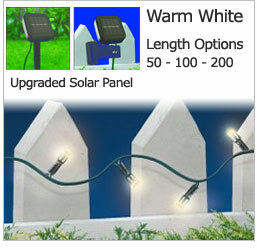 Our solar christmas lights will stay illuminated up to 8 hours on a full charge. There is a light sensor that automatically turns the lights on at dusk. A simple button on the back of the solar panel lets you switch between steady to blinking modes. Save money on electricity and extension cords. Save time on installation! What a great way to decorate outdoors for Christmas this year! Solar powered Christmas lights are such a fun way to harness the power of the sun! We have solar panels at our house to charge our battery back-up power system. My husband even designed a solar wood kiln- it dries firewood in a few weeks instead of waiting for it to season over a year. So, these solar Christmas lights fit right in at our house. My son helped me put them up around the little tree on the front lawn. We never could decorate this tree before because we would have had to run extension cords across the yard. They were super easy to put up, didn’t tangle and I didn’t have to worry about electric cords. We made sure the panel was facing south to get the best sun exposure. Even though it wasn’t very sunny the first day, that tree shone all night. You could still see the lights when i got up at 5am. I will be investing in a few more strands of these great lights so we can decorate a little more of our front yard every year. 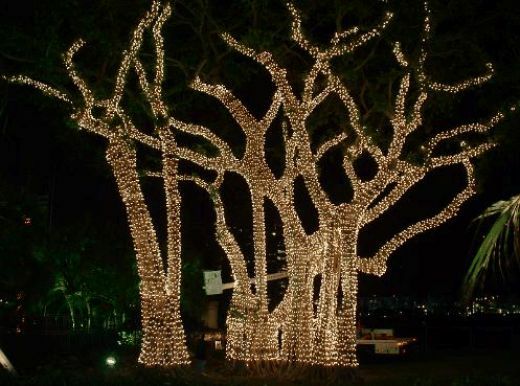 When we lived in Florida, my hubby and I spent a whole weekend putting up 50 strands or more of lights. I keep thinking about the nightmare of tangled cords, broken bulbs, half-lit strands and timers. None of that worry here. I highly recommend these Solar Powered Christmas lights for anyone who wants to keep in the spirit of Christmas without breaking the bank with a higher electricity bill. Take advantage of this great offer: Friend the Outdoor Solar Store on Facebook and save $10 off your first order. Go HERE to get the code. One lucky winner will get a string (200 bulbs) of Solar Powered Christmas Lights ($35 ARV) thanks to the Outdoor Solar Store! Giveaway open to US only. I put up a couple strings of led lights, a Snoopy Holiday flag, and a mail box cover! I would love to do more some day when we can afford it! Nothing yet,till I win these lights! Nothing yet this year.Id love to put these lights up when I win them! We don’t decorated much anymore outside.. if I won this though, I would string them on my deck! Not much – but we’d do more if we have solar powered lights! Santa windsock hanging from the porch and a Season’s Greetings sign on the house. No lights as we don’t want the added expense on the electric bill. Door stickies, window stickies and a strand of lights on our porch. We used to go all out… reindeer, little trees, icicle lights, garland on the deck…. but this year we kind of gave up. we haven’t done any decorations the last few years outside our apt. community doesn’t allow it ! We will be buying a home shortly so then we can decorate all we want ! Thank you for the giveaway ! Not much – just some decorations on the door. i decorate with lights, i have blowup christmas decors, I put out wooden Christmas dcorations, and wreaths. We do the tree, of course, and hang stockings on the walls, and put ornaments on the houseplants and christmas lights around the door frames. We try to add more every year. This year we have part of the house outlined, some trees, and a couple bushes. We put lights around our roof and fence. I decorate with lights and garland around the door,put wreths on all the windows, put out 2 lighted trees, and put lights on 14 bushes. My husband passed away I haven’t done any outdoor decorating, but I would love to do something on a smaller scale. We used to cover the house, wrap all the trees and use net lights on the shrubs. We also outlined the roof line and outer premises of the yard with rope lights. It was a job, but working together, we did it. We only have decorations on the door and inside the house. I’d love to put some lights outside! We put lights along the roof and we wrap our tree. We put up colored lights, got candy canes, a reindeer, snowman, and Santa popping out of tree. My hubby loves adding things to the outside of the house, thanks for a chance to win! Lights around the trees, lights on the gutters , and porch poles are wrapped with garland. Door has a wreath too. We decorate inside and out! The house, the windows, the bushes , the porch , the fence! Inside we decorate a tree, the mantle the windows and every nook n cranny we can find! A few decorations inside and some lights by the front door. we normally decorate the tree and fence with bows we came up with the perfect idea to hang lights on the tree also unfortunately there is no plug in so something like this would be perfect!!! 😀 Great giveaway!!! As of yet, I haven’t done any kind of decorating outside. I need to get more of the Christmas spirit. Maybe these would help!!! I have some lights on my bushes out front, a light up cardinal in the window, and an inflatable snowman. 🙂 I LOVE decorating outside! I don’t have anything to put outside, and we moved from an apt. to a house now, so I would like to start putting out lights. inside the house ,out side has had power issues.will not need a plug in with these. I have a blow up snowman and a wreath. We haven’t done any Christmas lights in this home yet as the wiring in our house is old and we don’t want any more possible electrical hazards. This solar powered Christmas lights would be perfect! Just some lights on front porch. Ususally it has been just stringed lights.